The US Environmental Protection Agency (EPA) has recognized two ethanol facilities for reducing energy consumption and greenhouse gas emissions. ENERGY STAR awards were given to POET Biorefining in Ashton, Iowa, and East Kansas Agri-Energy, LLC in Garnett, Kan., at the 24th annual International Fuel Ethanol Workshop and Expo in Nashville, Tenn.
"EPA is proud to recognize the outstanding pollution reduction and energy efficiency qualities of both ethanol facilities by presenting these ENERGY STAR Combined Heat and Power Awards. These facilities in Iowa and Kansas are making improvements that contribute to a cleaner and healthier environment," said EPA Region 7 Administrator John B. Askew. "POET is dedicated to making the process of producing ethanol even more efficient and environmentally friendly, so it's an honor to be recognized by EPA for the environmental benefits of the efficiencies built into our Ashton plant," said POET CEO Jeff Broin. 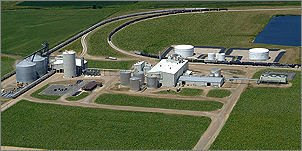 The East Kansas Agri-Energy dry mill ethanol plant in Garnett, Kan., began production in 2005. The steam turbine system generates approximately one-third of the facility's electrical demands. It requires approximately 23 percent less fuel than typical on-site thermal generation and purchased electricity. Based on this comparison, the plant reduces carbon dioxide emissions by an estimated 14,500 tons per year, which is equivalent to removing the annual emissions from 2,400 cars or planting 3,000 acres of forest. "Our East Kansas Agri-Energy plant includes an energy-efficient system, which transforms a requirement to control air pollution into an opportunity to address the plant's energy demands," said Plant Manager Doug Sommer. Dry mill ethanol facilities require large-scale, constant electricity and thermal loads, making these facilities an excellent fit for this innovative technology. These highly efficient and economical systems can use a variety of fuels, including natural gas or biomass. They can also improve the overall environmental benefits of biofuels by reducing the greenhouse gases associated with ethanol production. The EPA's ENERGY STAR program recognizes projects that reduce emissions and use at least five percent less fuel than state-of-the-art, comparable separate heat and power generation. Great news! Love hearing about recognition given to those who use CHP. I’m associated with Recycled Energy Development, a CHP company based outside of Chicago. My understanding is that RED’s founder Tom Casten actually coined the phrase CHP. What doesn’t get enough attention is that CHP and waste heat recovery — the latter of which captures heat that manufacturers are already emitting — can cut US greenhouse emissions by 20%, according to EPA and DoE estimates. At the same time, the process slashes energy costs by improving efficiency. We need to hear much more about this in the press.